At age 69, Sandi Zahar takes home around $3,100 a month from Social Security and her part-time job, but still relies on a food bank. She has diabetes and is a cancer survivor, and estimates that about a third of her income goes to her health care costs. Her income is too high to qualify for food stamps or Medicaid. And she needs to keep working to make ends meet. "I don't know how long I am going to be able to work," said Zahar, who lives in Texas. "Physically, I probably shouldn't be working ... it's taking a toll on my body." She's had to make some tough decisions on how to cut back. "I went on an insulin pump because Medicare pays for it. I don't like it, it's not as good for me, but it's cheaper," she said. Millions of Americans like her make too much money to qualify for federal assistance, but struggle to afford to put food on the table. More than 41 million people are "food insecure," meaning they don't have consistent access to adequate food, according to Feeding America. One in four people who are food insecure aren't likely to be eligible for most federal nutrition programs, a recent report from the hunger-relief organization found. That means they either go hungry, skip meals, or rely on food banks to fill in the gaps. Zahar gets a box of food from the food bank once a month. She's careful with how she spends money on food, buying in bulk when she can and cooking longer-lasting meals. Though the economy has greatly improved since the Great Recession, life is getting more expensive: Consumer prices have been rising, and while wages have started to tick up, some workers are finding their paychecks are being stretched too thin. The rate of food insecurity is currently higher than it was before the Great Recession. "Even in what seems to be a robust economic recovery, food insecurity remains at a historically high level," Feeding America President Matt Knott. Nearly every county in the country has families that can't afford to put an adequate amount of food on the table. Many earn too much to get government assistance. The problem tends to be more prevalent in the South and rural areas. Jefferson County, Mississippi, has the highest rate of food insecurity at 36%. Nearby Issaquena County has the highest number of children facing food insecurity at 40%. 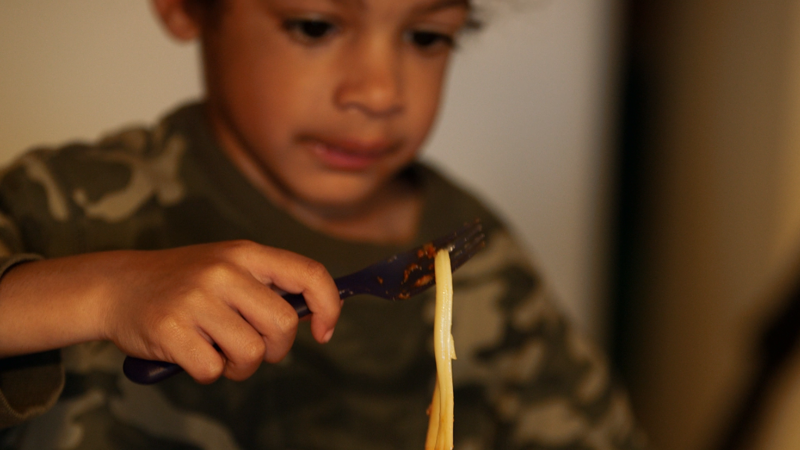 In every state, children are more likely than the general population to live in a home at risk of hunger, the report found. "The majority of people our pantries are serving aren't eligible [for government assistance]. We hear stories that they earn $1 or $2 over the limit," said Sarah Ormbrek, community relations director for Second Harvest, which is part of the Feeding America family. Ormbrek herself once relied on food banks and government aid to get by and had to make some tough choices. "I skipped meals, I was trying to get the most out of the money. So fresh vegetables or any fresh foods were out of the question. It was the cheapest processed lunch meat I could find," she recalled. "To this day, my son doesn't like pancakes. I would water down the batter to make it last longer." Some Republican lawmakers have been looking to overhaul the federal food stamps program, formally known as the Supplemental Nutrition Assistance Program, by requiring more recipients to work. Some experts fear this would cause many to lose their benefits. "We are the last line of defense. The government is the first line," said Knott. "The government's program serves 12 meals for every one meal we do. Any cuts can have a real effect on our network."